For global travellers, the constantly shifting price of airline tickets is one of the hottest topics of the travel experience. Whatever your tactic is – booking at noon on Tuesdays, during a thunderstorm, or clearing your internet cookies before you search – the factors that affect airfares has long been the source of myths and misconceptions. Out of all these, there’s one theory we’ve spotted on social media that surprised us the most. It’s come up a few times, so we want to puncture the myth once and for all and offer up a little bit of industry expertise to set the record straight. Here goes: companies like AirHelp force airlines to hike up ticket prices due to EC 261 compensation claims. A small number of people feel that airlines are losing money because they pay back passengers for flight delays and cancellations, and this is reflected in an increase in ticket prices. We can see the misunderstanding. It’s not your imagination that airline tickets have risen in recent years, and there are a number of reasons. However, it is a massive misconception that EC261 claims have an impact on airline profits or ticket prices. Independent transport consultancy firm Steer Davies Gleaves was hired to conduct a study on the impact that passenger legislation had on the airline’s finances and the industry as a whole. They found that even if 100% of passengers were paid out for claims under EC 261, it would only result in an increase of less than €1 per ticket. The price of tickets is in no way affected by EC 261 claims, and less than 8% of the total liability owed by airlines is ever paid. The cost that comes with delays and cancellations – crew overtime, airport fees, passenger re-routing, fuel etc – is thousands of times more than the total compensation payouts under EC261. Since 2013, AirHelp has helped over two million passengers globally to get flight compensation for delayed, cancelled and overbooked flights. The average compensation payout is around €650 per claim. This might seem like a substantial sum, but according to research, since 2015, 6.4 million passengers worldwide have been eligible for compensation under regulation EC 261. But only a small portion ever claim it back. That’s a big number of unhappy travellers who should be claiming money back, but haven’t filed a claim. Even if every single person did, it would have a negligible effect on ticket prices. There are still billions of dollars of unclaimed compensation every year. Another myth that is baffling us is that airlines are losing money or seeing a decline in profits. Last week it was reported that the International Airlines Group (IAG) has seen a 37% rise in profits for the first half of the year, from €710m a year ago up to €975m in 2017. The group, which owns both BA and Iberia, has seen no negative impact to business despite the IT outage at Heathrow in May involving British Airways. In spite of these incidents, operating profits for IAG have risen. This is due to lower fuel prices plus a strong Easter which saw a 4.6% increase in passenger numbers. Both Ryanair and United, who also were at the centre of the news with some bad publicity, have seen profits soar over the last year. If business is looking so good for major carriers, then why are we seeing a rise in ticket prices annually? More than almost any other, the airline industry has seen a huge period of consolidation over the last few years. Thanks to partnerships, mergers and bankruptcies, super-carrier airline groups now lead the industry. There are now only four major carrier groups in the United States with an operating revenue of over one billion dollars (American, Northwest, United and Delta). With the emergence of four major carriers, the industry has become less competitive for business, as airlines deliberately don’t compete on some routes. In Europe, KLM, IAG, Lufthansa and Ryanair are the major carriers that dominate the skies. Less competition means less need for cheaper prices. For shareholders, the industry is paying off as an investment. But for customers, not so much. While budget airlines keep prices cheap within Europe, the incentive to create lower fares has mostly disappeared. Airport capacity is another area that is affecting the price of airline tickets. Air traffic will continue to grow in the future as it has done for the past 50 years. But Europe will be unable to meet the increased demand for flights due to a shortage of capacity on the ground. According to a study conducted by the European Commission, by 2035 there will be over 50% more flights than there were across Europe in 2012. That’s 14.4 million up from 9 million in 2012. However, plans to increase airport capacity have been scaled back, with an estimated increase in capacity of just 17% by 2035. Europe needs to update the infrastructure of its aviation model, and until it does prices for tickets will continue to rise. 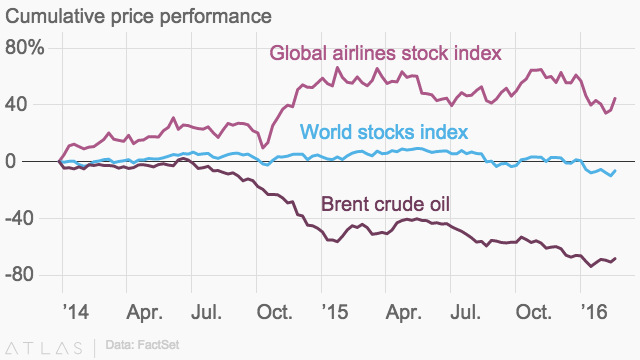 One of the more notable recent shifts in airline economics in 2017 has been the fall in oil prices. Jet fuel is made from oil, and makes up the major share of flight operating costs along with flight crew and maintenance. But this year has seen a significant drop in the price of oil, which hasn’t been reflected in the cost for air tickets. Prices have been falling over the last few years, yet why aren’t customers seeing any benefit? The reasons for this are multiple. With the emergence of major carrier groups in Europe and US, the industry has become less competitive, with fixed competition that sees profits increase. It’s also a case of supply and demand. Too many passengers are buying tickets at current prices for there to be a change in market prices. Providers have little incentive to lower their prices, even when their costs go down. Although EC 261 claims have absolutely no impact on the price of airfares, it’s been a discussion point ever since air passenger rights laws were introduced. The EC 261 regulation was brought in to protect the basic rights of air passengers in cases of travel disruptions like delays, cancellations and overbookings. Without any basic rights, passengers who experience travel disruptions would be at a major disadvantage. As only a small percentage of passengers eligible under EC 261 end up claiming the compensation that is rightfully theirs, making people aware of their air passenger rights is crucial to a fair and open service from airlines. So there you have it. The facts show that EC261 claims have absolutely no affect on the price of tickets. We are glad we had the chance to debunk the myth and offer some wisdom on what’s making airfares continue to rise. Next time air travel doesn’t go according to plan, you know where to find us. We’ll be waiting. We’ll leave you in the capable hands of Scott who can give you the basics of air passenger rights.